One of the most revered and holiest places in India is the Vishwanath Temple. 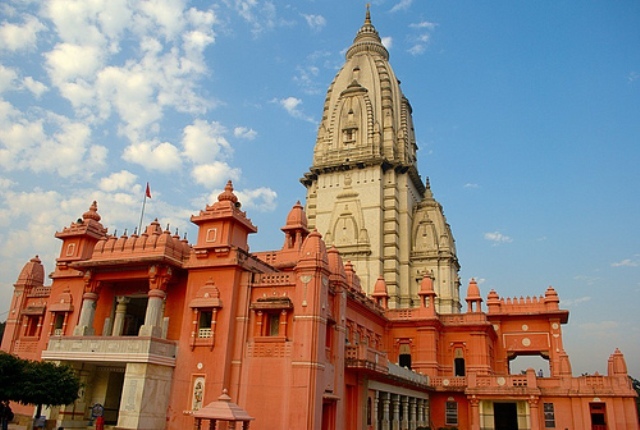 Originally built in 1490, the temple is located in the Eastern part of Uttar Pradesh state of India. This temple was said to be one of the 12 temples where the Lord Shiva is worshipped in the form of Jyotirlingam or “the Lingam of Light”. This is because Varanasi was said to be the center from which the fiery pillar of light broke through when Shiva showed his supremacy over the other gods. Today, this temple is a popular destination among Hindus in pilgrimage and other tourists who are drawn to city’s history. This Golden Temple is cradled near the Dashashwamedh Ghat of the Ganges River. However, getting to the holiest place in the city is quite a physical challenge. Who would have thought that a narrow crowded little alley along Vishwanatha Lane would lead up to one of the most important Hindu temples. Approaching the temple, visitors cannot help but appreciate the architectural design of the building. The golden dome and spires are truly a remarkable sight. Inside the temple’s courtyard, visitors will be able to see a mandapa or a pillared hall and several shrines. But the most elaborate feature of the temple would have to be the gold plating on the 15.5-meter high spire and dome adorning the temple. Unfortunately, non-Hindus are not allowed entrance to the holy place of worship. Instead, visitors will have to make do with admiring the temple from the outside. Fortunately, a stroll along Vishwanath Galli or lane will already allow a glimpse of the temple’s religious treasures. Few other important structures include the three temples found at the southern part of the complex, which are dedicated to Lord Vishnu, Virupakshi Gauri and Avimukta Vinayaka respectively. A well can also be seen on the side of the temple called Jnana Vapi. This was believed to be the hiding place of Jytorlinga to seek safety during the time of invasion. There are several lingas in the temples’ vicinity but the main deity at the shrine is made of black stone and housed in a silver altar. The linga, to Hindus, is a symbol of energy in a beginning less and endless form as it represents the infinite nature of Shiva. It will take some time to absorb all that can be seen in the temples’ complex. If you do not have a background in Hinduism, it will be best to learn a little knowledge about the place to be able to fully appreciate the trip. A visit to the Vishwanath Temple in the Hindu tradition, together with a bath in the Ganges, is believed to be the way to moksha or liberation in order to end one’s sufferings involved in the life and death cycle. This then explains the thousands of pilgrims visiting the temple each year. However, Hindu or not, the Vishwanath temple successfully stirs a cultural and religious sense in a person. Being a spiritual place that it is, the temple exudes energy of unity that becomes a man’s channel to reflect on his need to live in peace and harmony.